High atop the 57th floor rooftop paradise of the Marina Bay Sands Hotel in Singapore, we look out from this artificial precipice. It is here, in downtown Singapore, where Las Vegas meets the once colonial city. This is where the most extravagant impulses of Western hyperreality have sprung up in the East. 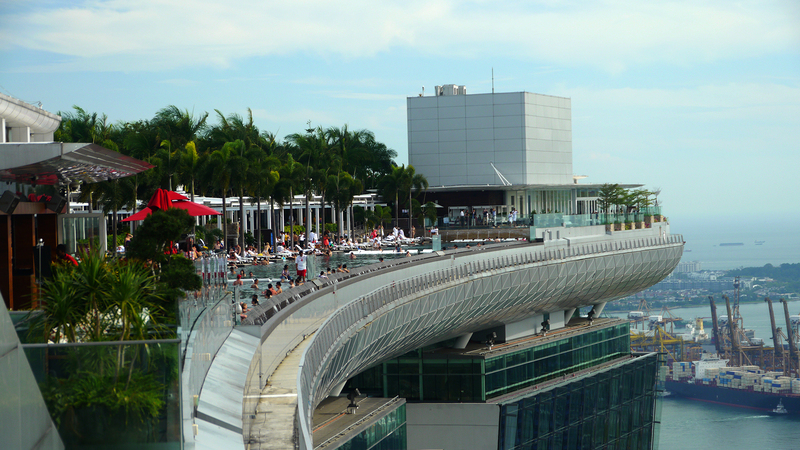 The rooftop paradise of the Marina Bay “infinity pool” radically shifts our perspective to the vertigo of swimming to the edge: the edge of the pool, the edge of perception, the edge of illusion, and yes, the edge of Eastern civilization. Singapore is a contemporary hybrid city without an ancient history. It’s as though Sir Thomas Stamford Raffles invented the culture here in the early 19th century, when he claimed for the British a strategic seaport just south of Malaysia. Any sense of the previous indigenous culture seems to have been thrown out the window. So it is not surprising that this extreme form of Vegas-inspired contemporary decadence reigns over downtown Singapore. This rooftop-floating-ship building, designed by Moshe Safdie Architects, is like a beach resort high atop a trio of skyscrapers. It’s a floating equatorial nautical nirvana of Singapore Slings, infinity pools, and lush tropical gardens all rising majestically into the hot sky of the city. The edge of the real.